According to Wikipedia, China currently has 10 year visa agreements with Canada, US, Israel and UK. What are the conditions of applying for such a visa? Do you have to travel to China a few times on ordinary visas first? Do you have to ask for a special form? Can anyone apply or just selected persons? Much of this is answered on this FAQ of a visa company. It is not official info but it looks good to me. Also it seems to apply for US citizens only, but I assume similar for the other nationalities you list. It also does not cost more nor take longer to process. You only need to provide documentation (flight/hotel/invitation/...) for your first trip. Apparently the visa form does not have a 10-year option that you can check but they suggest to tick "other" and write "10 years" in the blank space. From my recent experience with the official Toronto processing center (an efficient 15th floor operation which has been separated from the consulate for some time, thank goodness). There is basically one price, which varies only with processing time request and if it needs to be shipped back to you. The 10 year business (M) visa requires an written invitation from an appropriate mainland company, preferably with ID from the Chinese side and they require some description of the business you intend to pursue. The cost is shown here- at the time of this writing it is $145.20 for Canadian citizens and $185.20 for U.S. citizens (CAD) for the cheapest (longest) processing time and self pickup/drop-off. As I said the price is the same regardless of the number of entries and duration of each entry. (there may be another price schedule for other than (L) and (M) types). They generally have seemed cool in the past with traveling on a tourist (L) visa to trade shows and such like (buying, not selling or starting up a business), but that could change at any time, so the extra legwork for the (M) is worth it if you intend to pursue business. The length of visa granted (if any) is said to be determined by the consulate. Having previous visas is apparently a positive indicator for getting more time, but the process appears to be a bit opaque. In my case I supplied color photocopies of a couple previous visas- which they included to the consulate so I know they were not superfluous- they gave me back another document they deemed not important- and was granted an (M) visa with 108 months validity, which they said was the maximum. Not sure why- but perhaps because I had an existing visa in an old passport still valid for a few months, and they probably require 6 months passport validity. The visa form has not been revised yet to to include the 10 year option, so I wrote it in. I've gotten Chinese Visas 3 or so times and recently helped my family get them too for a trip. This advice applies to the SF consulate, the only office I've visited. We had no problem getting the visas added to our new passports. Do you have to travel to China a few times on ordinary visas first? Generally not. Applying through a processing service can help and is worth the cost (about $40 in my experience) if you live more than a few minutes from the Consulate. Do you have to ask for a special form? Can anyone apply or just selected persons? No. At this time the "Form V.2013" is the current form accepted. Simply use the other field as shown below. Not the answer you're looking for? Browse other questions tagged visas customs-and-immigration china multiple-entry long-term or ask your own question. 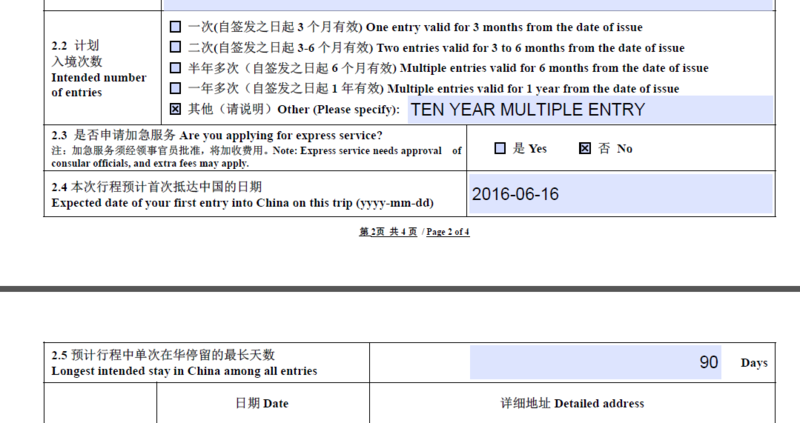 Can a normal backpacker obtain a multiple-entry Chinese visa while on the road? How long does the tourist visa extension process take in Guangzhou, China? Can I demand my passport back in the middle of an application for a Chinese Visa in the UK? Applying for a Ukranian multiple-entry visa, how should I fill in the application? How does a UK passport holder obtain a two-year multiple-entry visa for China? Can I use a valid Chinese visa in my expired UK passport if I have renewed my passport?